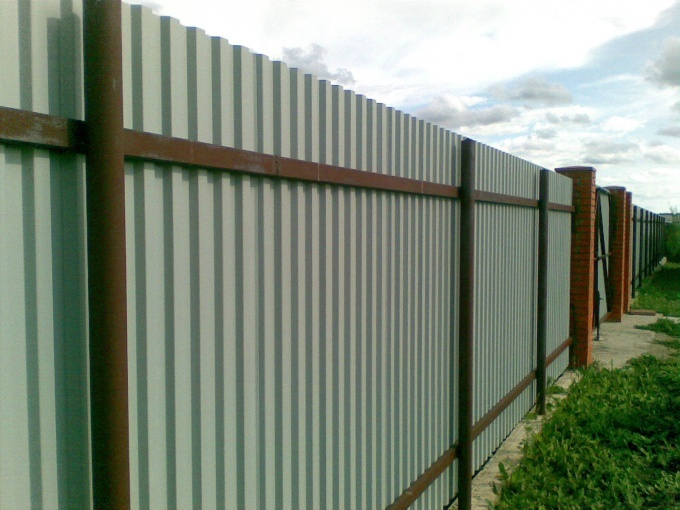 Posts for fence installs a variety of wood, asbestos cement, steel, brick. The installation method depends on the material, but one thing unites any posts, they should be set evenly, securely and to consider the state of the soil. To install brick pillars, dig a trench for the Foundation laying. The depth of the trench do the same, as the installation of greenhouses, 50-70 cm Install formwork, add a bottom 20-25 cm sand and crushed stone, all tightly tamp it and pour the Foundation. The ratio of concrete shall be as when pouring of all foundations and consist of 1 part cement, 3 parts sand and 3 parts gravel. Give the Foundation time to gain strength, put two rows of plinth of red brick. Mark on the pillars. First, mark the edges, then measure the entire length, divide it into equal parts and make masonry pillars. Masonry pillars entrust a professional Mason because the occupation is very difficult. Each post must measure in the exact line as in the construction of the corners of the house, otherwise they will have different angles and can go in different directions. In General, having no experience, put the pillars is impossible, though it seems a simple matter. To install iron, wood, asbestos-cement columns, use a construction drill. This will allow the smallest way to loosen the soil around the poles, and for their fastening will take much less gravel and sand. But you can dig holes for poles and shovel, if construction drill anywhere to get failed. Mark the distance, pull the wire on the installed pegs. Select columns, check the installation plumb, fill the resulting hole with rubble and sand, again check the posts plumb, tamp everything thoroughly. To secure the posts, you can use grout the same as for the pouring of the Foundation. To do this, set the columns evenly, fill the holes with mortar, tamp the mortar with a stick to release the bubbles which make the mortar less durable. If the soil in your area is sandy peat, in General, are fragile, then before you set the posts, bottom holes for them to add gravel and tamp thoroughly. Only on a layer of gravel to set the posts. For greater strength can around the installed posts to do the formwork and pour cement mortar. Get a thin strip Foundation where the columns will be securely fastened.